Knowing you often write about Food on Fridays, and knowing you commented on the fun of bringing home food while out on a run, I was a little worried where this post might be going–I thought maybe one of the chickens was going to be brought home to lay some eggs for you!! Instead, you offer a sweet lesson. Thanks for posting this, Trish! Ahhh you know me well Ann! I’ve been working on my family concerning chicken ownership. So far no movement in the coop. 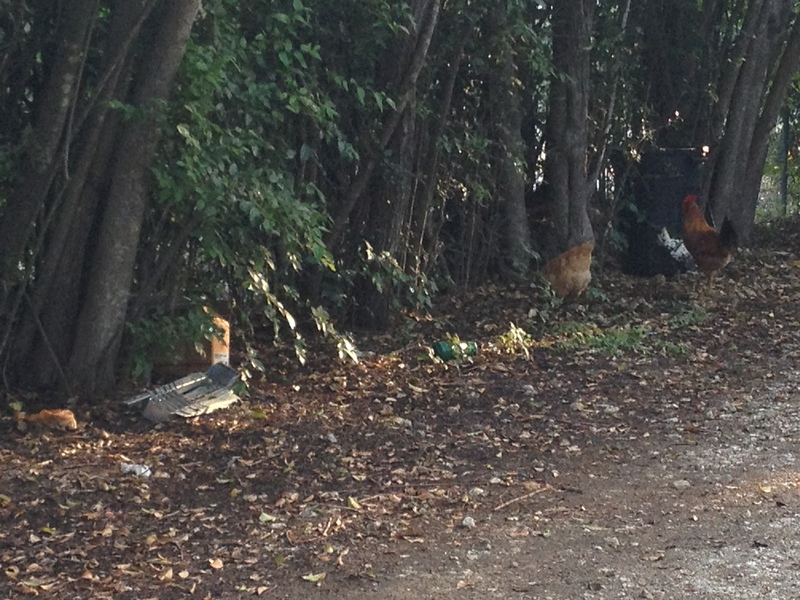 Roosters are pretty noisy in our area in the early morning. The sound makes me smile. That was nice that the officer took them home. The site looked like the rooster would have had a full-time job protecting them from predators. I’m not sure I would have noticed them if the rooster didn’t have such stong lungs.